I have been working though IPexpert’s lab workbook two, making steady progress through the labs with some good advice from Jared over at IPexpert. Hopefully I can finish these up within the next couple of weeks. My core stuff seems to be strong, atleast while working through the workbook. I do have access to the Cisco 360 reference library as well that I have been reading everyday which seems to break things down quickly for a good review. IPexperts camp in September, then my lab. I know this seems excessive, but one thing that is hard to do at home is shut the world out and do nothing but lab and submerse myself in the material. It just is impossible to do with an infant running around 🙂 So that will give me three solid weeks of doing nothing but labs and reading. Hopefully that puts me over the top. I have a lab date booked right now, but was wondering if it is worth the chance to drop the date until after going to Narbik’s atleast once. I was thinking what would I do if he gave me the go ahead to schedule the lab thinking I was ready? As of right now all the dates are booked up solid until the 18th. Do I drop my current date and chance it that more dates will open up when people have to start paying for them? Or just keep my date and just keep working through all the material until the end? Not sure, atleast right now I have a lab date. Yes, it’s official!!!! After a grueling 9 hour wait, most of which was in my hotel room here in Raleigh, I just got my score report, and I am officially CCIE #24347!!!! !Â Ahhhhhhhhhhhh!!!!! The greatest 5 #’s I have ever heard!Â Keep in mind, that I am 5.5 beers in at this point as I decided around 10:30 that no matter what I was having a 6 pack for my troubles hehe.Â So what can I say?Â I guess I will give you my experience today and a little bit about my preparation. I flew into Raleigh Sunday afternoon, and stayed atÂ the Wingate.Â The Wingate cameÂ highly recommended by the many that have gone before me, and they were right on.Â I can’t recommend it enough.Â They picked me up at the airport, and took me right to the hotel.Â When I inquired about where I could walk to pick up some redbull for the lab the next day, they DROVE ME to the nearest gas station like it was just normal.Â I guess that is the southern love…being from Detroit, I’m not used to that sort of thing hehe.Â When I was picked up at the airport I was told I was the 3rd CCIE candidate being picked up that day…they knew exactly what I was there for, and exactly what to do. The lab started at 7:15, and I was told the shuttle from the hotel to Cisco would leave about 6:30, giving us plenty of time.Â I woke up at 6:00 AM, threw on my jeans and T-shirt (opted against the sweatpants!!! ), grabbed my 3 large size redbulls from the fridge and headed down to the hotel breakfast area.Â I was too nervous to eat a thing.Â I chatted up the other 2 candidates staying there and passively sipped a cup of coffee.Â The other 2 guys were doing voice, so there wasn’t reallyÂ much to talk about.Â The shuttle drove us over to Cisco and we were there by 6:45…in total there were about 6 of us waiting outside…it was the most awkward thing EVER….after some brief introductions by a few of us, it was DEAD SILENCE for 30 minutes as we stood outside and waited for the proctor to show up.Â Our proctor pulled in about 7:10, and took us into the lobby where we were ID’d and given our temp stickers and rack numbers.Â The proctor gave us all the regular instructions and told us basically where the bathrooms and drinks were, and gave us the general rules of the lab (get rid of any macros at the end of the day, save your configs often, etc…). I sat down at my pod and started in on the OEQ … the first one threw me….it seemed very simple.Â All I can say without breaking NDA is that it was some command output and a diagram, and I couldn’t place the answer… I gave it my best shot and moved on.Â The other 3 questions were no problem at all, although later in the day I feared I might have messed up the wording of one of them….all in all it took me about 5 minutes.Â Guys, after reading all the posts and fear regarding this I have to say, IF you have studied properly, there is nothing to fear!!! If youâ€™re preparing for your CCIE R&S, Voice or Security, and your training budget is a concern, be sure to review our May 2009 promotion.Throughout this month only, our online (live â€“ instructor led) virtual classes (and bundled vClasses & our complete self-study end-to-end / BLS) are discounted if you reference the following discount code: MD05VSR (in order to receive this promotion pricing please contact one of our CCIE-focused Training Advisors directly. This was a post from Petr Lapukhov from INE on a question about the 2600’s and the 12.4T code being used for the 4.0 hardware revision. We should start to see more configuration options in the coming weeks I would think from all the vendors. Well as many of you know there were rumor changes coming to the CCIE R&S lab. As of last night Cisco made those changes official. 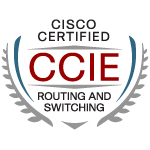 To reflect the growth of the network as a service platform, Cisco is revising the certification requirements for CCIE Routing & Switching (CCIE R&S)â€“the expert level certification for network engineers. The new requirements were developed with assistance from Cisco enterprise customers and reflect the expectations of employers across industries. What does this do to my plans? Well it makes sure I pass the lab exam by October 17th. I hit Cisco live at the end of June, then Narbik’s at the end of August, then maybe back to Narbik again right before taking the lab. Not sure yet. It should definitely be an interesting couple of days today to see how all the training vendors release their information. 1) There will now be a seperate 2 hour troubleshooting section of the exam.Â You will be given “trouble tickets” similar to like in a real environment, and will have 2 hours to solve them.Â After your troubleshooting section,Â you go on to the now 6 hour configuration section of the exam. 3) Seems mostly everything else is the same.Â Frame-Relay is here to stay… also I noticed they specifically added PPP over Ethernet. Hope all you guys out there that have a lab coming up pass the first try : )Â If not, its going to be learning a lot of new material, at least for me, and probably investing in more training. Hey guys, Joe here typing at you all from my hotel room in San Jose, California!Â It’s been a GREAT week out here at IPexpert bootcamp.Â Aside from losing my job recently, and being worried out of my mind, this has been a really good end to my first attempt preperation. I decided to take the class after I got a fairly decent tax refund this year, mainly to review right before my exam, get a different perspective on some things I was struggling with late, and get a real CCIE instructor’s opinions on if I was “ready” for the beast. I had no idea what to really expect, and I have to say I have been thoroughly impresssed by the overall quality of the program, and the instructor. I landed in San Jose late Sunday night (about 10:00 PM PST).Â By the time I got my luggage, found a shuttle to the car rental, waited in line, got my car, found and checked into my hotel, it was about midnight or so (3:00 AM EST so I had a little jetlag).Â I got right to bed so I could start off the week on the right foot. I was so grateful I did my hotel research, and that as a result the Holiday Inn I am at ended up being about 1 mile from the IPexpert facility out here.Â I managed to find no less than 2 Starbuck’s on the way there!Â I had no idea what to expect going in…who would my classmates be?Â Would Jared live up to his reputation?Â How would the course turn out?